﻿ Bairnsley Highlands - Highland coat colour - the E locus. The A locus, or the agouti locus is on chromosome 13 and colour variations will only be seen here with E+/E+ or E+/e combinations (or the wild type genetic make up at the E locus). Otherwise the colours at the A locus will be masked. 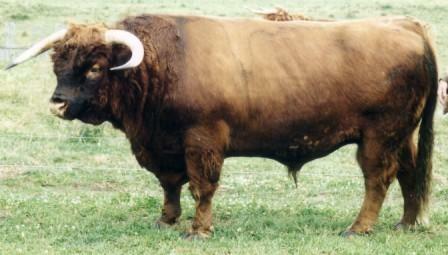 A+/A+ or A+/a will show the true wild type or shaded colour as seen in Jersey cattle, and less classically in Highland cattle. Some of these animals may have been mistakingly registered as brindle in the Highland Cattle Herdbook. Abr has been established to be the gene for brindle colouring in Normande cattle (8), and is now known to account for the brindle pattern in Highlands as well (Schmutz, personal communication). To explain the difference between heavily brindled and more sparsely brindled Highlands, I postulate that the differences may be associated with being homozygous (Abr/Abr) causing more obvious brindling, or the heterozygous state (e.g. A+/Abr) causing a less obvious brindling pattern. We have all seen these different patterns in Highlands and there may well be other explanations for this appearance. The brindling intensity appears to vary with the expression of black hairs in different parts of the body, on the underlying coat colour which in all cases must be the wild type (E+/E+ or E+/e). Black hairs are more common around the head and neck of the wild type colouring, and hence the brindled pattern is similarly distributed. Similar to many other colour types, we have found that it is much easier to pick the true colour in summer when the coat is short. A recessive allele at this locus (a) has been reported in other species, which is actually recessive black. Although it has not been reported in cattle, it's presence in Highland cattle may be able to explain the occasional black animals coming from two red parents. Interestingly, this appears much more likely if the sire and dam are brindle, even where the is no history of black in either pedigree. This later event suggests that a more plausible explanation may lie elsewhere.